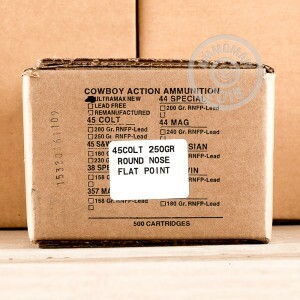 Who better to make your cowboy rounds than an American company that proudly manufacturers their ammo in Rapid City, South Dakota? Ultramax is just that type of company, patriotically providing ammunition for a variety of different shooting applications. 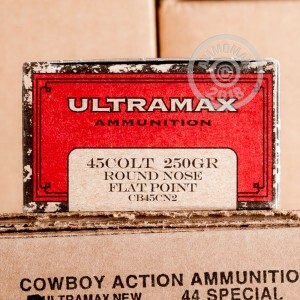 The 45 Colt was invented in 1872, providing the high power that cowboys around the nation needed. 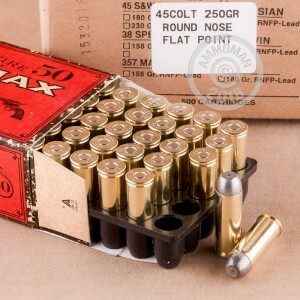 With these brass cased, boxer primed lead round nose cartridges, you have just what you need to get your wheel guns spinning out at the range. These 250 grain beauties fire at 800 feet per second, providing just the power you need for a successful day of target shooting. Do you need more than a couple boxes? At AmmoMan.com all orders over $99 will qualify for Free Shipping! So stock up and save more!